The control panels were next to be done. As with my previous projects, I decided to put a layer of acrylic over the artwork to help keep it clean and extend its lifespan. Plus I think it gives a nice finish to the control panels. As you can see with the P1 and P2 start buttons, I went with different buttons to ensure everything fit and was not overcrowded on the right. 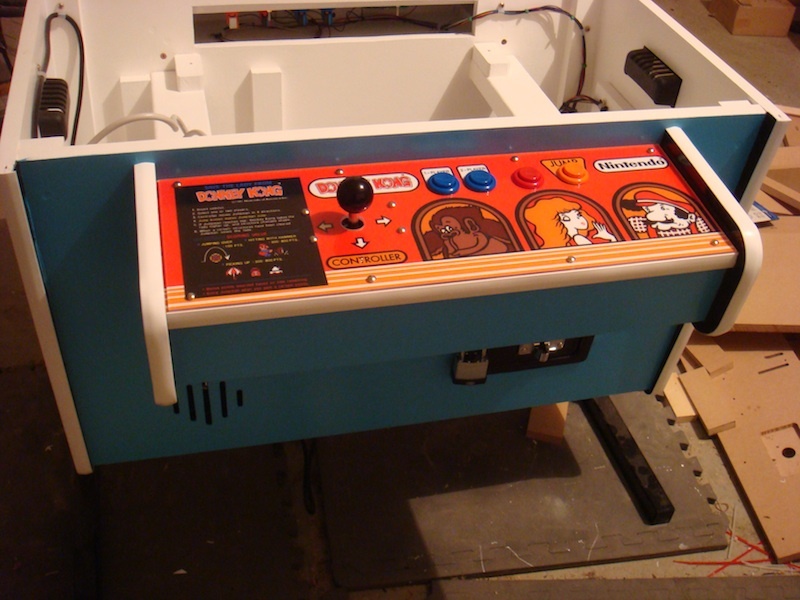 I also extended to the top of the control panel to allow for a strip of t moulding to sit at the end (as I did with my Donkey Kong cocktail) which should give it a nice finish. 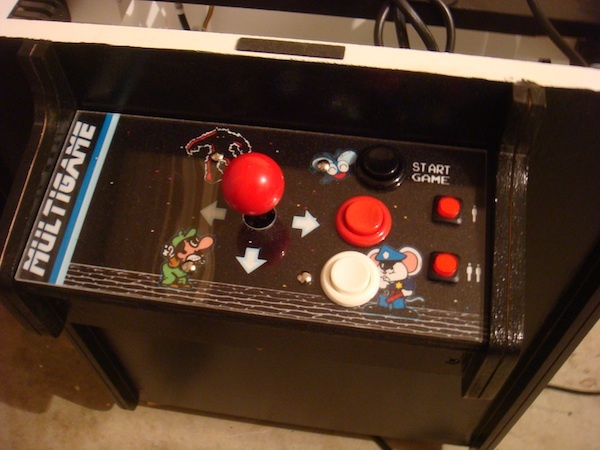 Note: I still need to add the t moulding to the control panel front and sides – just waiting on it arriving. I’ve ordered both light blue and light green (Galaxian) and will see which one looks best. This project was completed about a month ago and i’ve been a little slack in getting the posts up for it. But here they are – Project #4. After a bit of a break from building machines, I was recently contacted about building a new cocktail cabinet. I had hopped to do a space invaders or frogger cocktail next, but this request was for multigame style artwork – so that’s what this will be. I finally got around to completing the project this weekend. Last week I organised the glass place to measure and cut the glass top for me. I also had some small DK marquees printed up, which will sit under the glass on the table top. These were simply done at BigW at $3 each. Some more photos – now with tmolding completed on the control panels, caps added to the legs, a pad lock on the coin door and paint touched up. Lighting isn’t the best, but never mind. It’s been a good few weeks on the cocktail cab project. As always, managing an hour here, 30 minutes there to keep moving it all along. I have spent time painting the monitor frame and table top panel over the last few weeks – a slow process when you can only get 1 coat in per day. The first thing that went on since the last update was the coin door, along with it the coin mech, coin catcher and coin counter. Just to the left of the door (inside) sits the service and test switches. These have all been wired up and tested. The power board and switcher were also installed. 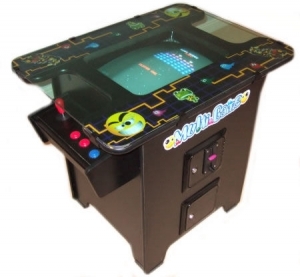 The speaker went in and was wired up, along with the game board and JAMMA harness. I spent time also tiding up the cabling. 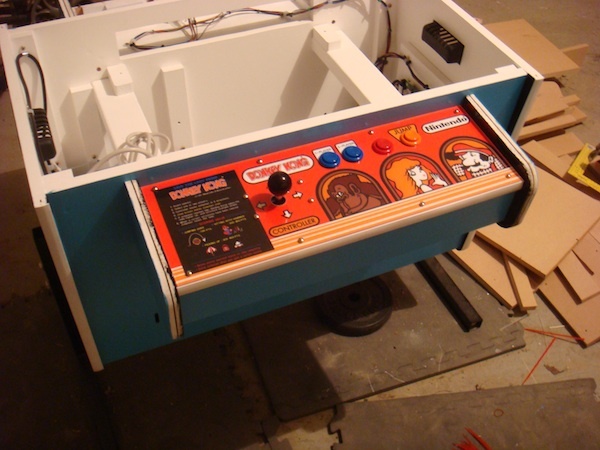 The player 1 control panel has also been installed and wired up.